Let’s say you want to build your first affiliate marketing site. You’ve decided what’s the niche you’re gonna cover, you’ve bought the domain, and you’ve opted to use WordPress because it’s a fairly simple way to build a site even if you’re not a tech guru. Then, you’re suddenly presented with thousands of possible design options and themes for your site, and that vehicle you used to call your enthusiasm comes to a screeching halt. How the hell can you possibly decide which one is good for you? How to know how many premium WordPress themes there are and how to pick the best one? I guess that question has no definitive answer. Even so, I hope this list of 29 affiliate WordPress themes is gonna help you make the right call! If your game is the adult niche, make sure you check our list of the best adult site themes. The “fastest SEO theme for WordPress” does live up to its name. It’s an ultra-fast, SEO-friendly theme designed for high performance. It has rich snippet support, custom CSS support, built-in review and comment system and, of course, Ad management. In addition, it’s structured in a way that tells the search engine exactly which part of your blog is which, improving indexing of your page and, by extent, netting you a higher ranking in the SERPs. This incredible performance does come with a cost, though: Schema has fairly modest visualization options, and its simplistic design might be a turnoff for some. This theme is built around getting the best experience for your audience, but it’s designed for tech-savvy marketers who can effectively leverage all the options it offers. The potential benefits of this template are simply amazing. 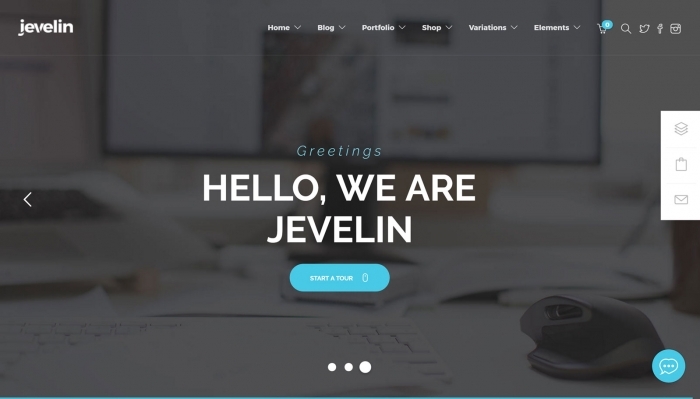 One of the most popular themes, Jevelin is a multi-purpose, mobile-ready, WordPress premium theme. The $59 pack includes the theme, future updates, and 6-month support from Shufflehound (Jevelein’s developer). Furthermore, what you get is a very flexible workspace with more than 40 elements with different styles, 9 different headers (including parallax), all with the top, left, and right layouts. You have multiple pagination options and you can create different logos for your mobile and desktop sites. Customization and UI are fairly clear and simple to use and you can access almost all of the options from an admin panel. 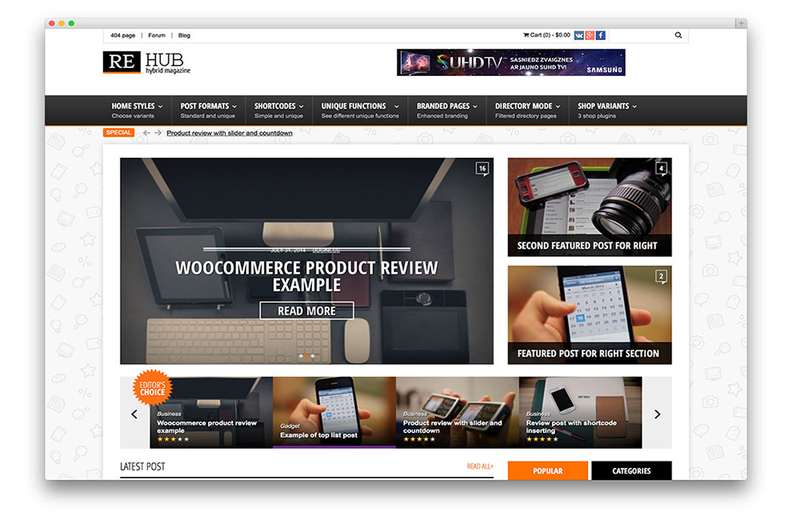 One of the biggest selling points of this theme is the WooCommerce integration. It basically allows you to create a marketplace-type site where you can sell pretty much anything. Besides WooCommerce, it has a built-in slider revolution plugin for slideshows and a Contact Form 7 plugin for various types of forms, which makes it an ideal theme for designing various landers and pre-landers. This theme is extremely flexible. It’s no wonder that it’s used by a great deal of corporate and business websites, as well as various online stores. This really is one of the best WordPress themes for affiliate marketers. As the title says, this is a WordPress framework, rather than a theme. The functionality remains the same – it just means the themes have to be created or downloaded from the Genesis marketplace. The one-time fee will net you unlimited support, tutorials and the framework itself. Additional themes have to be purchased separately, though. Adding Genesis Framework to your WP site requires little skill. For your effort, you’re rewarded with a wide range of tools and options to tailor the look and feel as you see fit. By including Genesis, you get access to a ton of theme options, in-built SEO tools, options to present your content in more than one column, and fully customizable sidebars that can be placed both left and right. The cherry on top of the New York Cheesecake? These include multimedia support, tabbed pages, responsive design, quick formatting options, and different comment section options. All in all, Genesis is an awesome tool for any prospective affiliate marketer. If you can see past the initial investment, it can really make your life easier. As the name suggests, Steady Income is one of those affiliate WordPress themes built with a commercial use in mind. It’s 100% responsive and it’s got a ton of options and widgets designed to improve your online visibility and increase traffic to your site. For your money, you get the theme, unlimited domain usage and one year of full support. The whole concept is designed around the latest trends in online marketing. Indeed, you’ll find prominent share buttons, subscription boxes for both promotions, newsletters, featured products, and so on. SteadyIncome is designed to scale to any screen size and includes optimized code that should minimize loading times, which is a very important aspect for an enjoyable customer experience. Ad revenue optimization is built into the theme, making this a prototypical affiliate marketing WordPress theme. Entrepreneurship is another responsive, mobile-friendly theme, best used for various types of online publications and magazines. That being said, it has a plethora of remarkably useful development and design options to offer. It offers up to 3 columns for content, in-built SEO, AdSense and speed (loading time) optimization, parallax scrolling, social media toolbox, advanced typography… The list of features goes on and on. Built with online publications in mind, it’s designed to handle a large volume of written content and multimedia files that accompany it, and it pays special attention to the visual representation and shareability of your site. This spiffy package will set you back $69 ($59 on sale), and you get the same package as with SteadyIncome – one year support, tutorials, unlimited domain usage, and 30-day money back policy. You might have guessed it already, but this theme is aimed at marketers. Whether or not that moniker is true is of no consequence. The truth of the matter is that this theme does come with a chock-full of amazing tools to build your affiliate website the way you want it. It’s constantly updated, and it tries to implement as much of current marketing trends into its design, all for the sake of maximizing conversion rates and optimizing your sales funnel. It focuses on warm color schemes, has a thin header that gives more space for content, a bold blog heading that’s very easy to see, an integrated promote box on your homepage (if you choose to use it), and various promotion and subscription options. Obviously, it’s responsive, mobile friendly, fast, with prominent social buttons. This is a marketer’s dream and it’ll cost you $59, with the same conditions as other ThemeForest themes (Jevelin, for example). 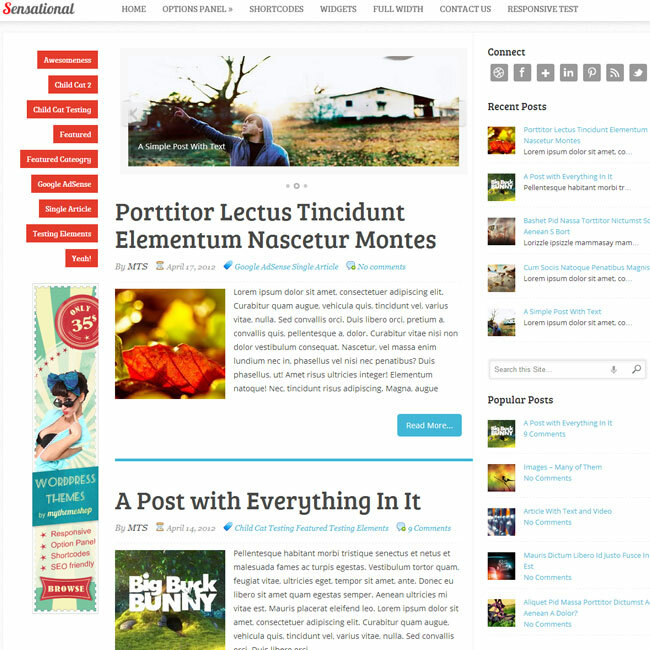 Another theme built for newspaper and magazine websites, it also focuses on visual presentation and multimedia content. While it might be built for a more specific use than other more flexible themes, one thing is for sure: it’s just beautiful! It’s got an integrated visual composer that allows you to drag and drop elements and create content rich webpages without any coding knowledge, all the while keeping the design responsive. It has an integrated slideshow presenter, a lightbox (pop-up style) photo gallery, and all the other cool things you might need for your web publication. Even though it’s geared toward magazine-style sites, it shouldn’t be discarded by affiliate marketers. It’s got WooCommerce integration, bbPress and BuddyPress plugins, making it a well-rounded theme that can be used for pretty much anything. Another interesting feature is that it’s multilingual-ready. Wanna create a dope non-English magazine? This is probably the theme you’d wanna go for! As you may have guessed, the price is 59$. I know: still no free WordPress themes for you to check! A theme with a bit of a twist, KUPON is built for daily deals and coupons websites. It’s simple to use, with a very clean interface, and all the necessary features needed to build a fully-functional coupon site are included – no need for any third-party plugins. KUPON has integrated WC vendors and WooComerce that deal with Backend, cart, checkout, and other market functions for your site. In addition, it’s got integrated WooCommerce PDF vouchers – a tool that’s a must-have for any self-respecting voucher and coupon website. Besides these obvious uses, KUPON is great for affiliate marketers who need a solid framework to present multiple and varied catalogs for all your affiliate partners, and the search and sort options available make it a breeze for your visitors to find what they’re looking for. On the visual side, KUPON has an array of options for customization, powered by the Visual Composer and Yellow Pencil Visual CSS Style Editor. As an added benefit, it’s a bit more affordable than other themes. In fact, for $49, you can get all the future updates and 6-month support. The simplicity of its name is very appropriate for Doo. Designated as a “Front-end design tool” it trades a bit of the in-depth customization other themes offer for an easy, fast, and no-frills experience. While Doo’s end goal is not heavy-duty websites, it’s almost ideal for affiliate marketing and it’s got a generous number of features included. Headers, footers, and sidebars are fully customizable, as are submission forms, search and filter forms. It’s compatible with YITH subscriptions, WC vendors, and Contact Form 7 plugins. Doo has an identical PHP/JS code part with a KUPON theme, and it also includes a Yellow Pencil CSS Editor (priced at $25). At 39$, the base price is quite a bit lower than usual. Even so, you should know the WooCommerce plugin isn’t included in the price which means you’ve gotta pay for it. The additional charge for WooCommerce isn’t really something which destroys this theme, since Doo gives you a pretty good bang for your buck! One of those very robust and reliable affiliate WordPress themes, MagOne is built with blog and newspaper sites in mind. It offers several nice-looking preset themes as well as a wealth of customization options. It’s got a clean and modern responsive design which is powered by the Sheeit framework, allowing you to simply drag and drop various elements and change your theme on the fly. Sticky sidebars, floating menus, and flexible headers will all allow you to tailor your experience as you want with ease, improving the user experience, potentially bringing in more traffic, and hopefully getting more clicks on those ads. MagOne supports multiple comment systems, including Blogger, Google+, Facebook, and Disqus, and you can set your own primary system if you want to. In addition, this theme is dirt-cheap at $22, with 6-month support. 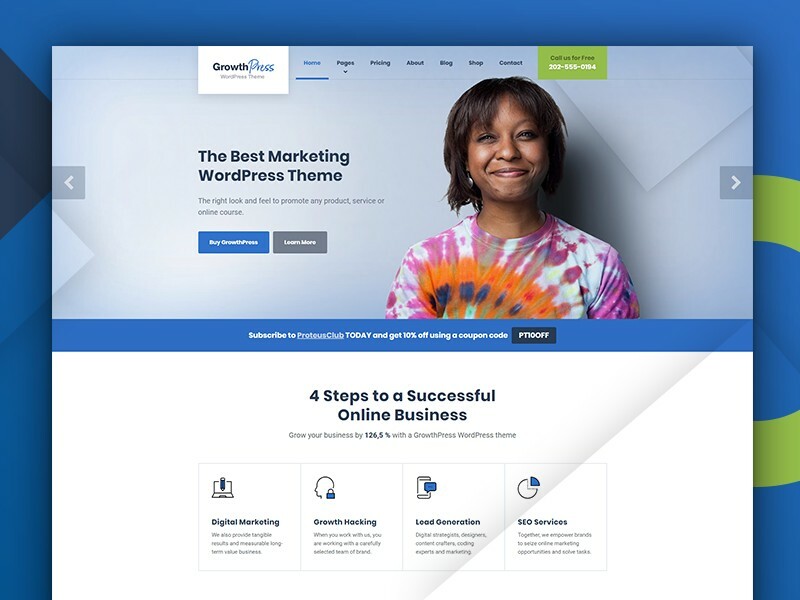 GrowthPress is an all-around marketing WordPress theme, perfect for almost any kind of online business. With a beautiful modern design and powerful features, GrowthPress can be used as a landing page for your SaaS (software-as-a-service) business, a presentational page of your mobile application, or simply as a website for your SEO agency. It has a uniquely designed sales page with an option to hide the main navigation, which means you’ll increase your website conversion rate and turn more visitors into leads and then into sales. With an integration of WooCommerce, GrowthPress also allows you to set up an online store in no-time and immediately start selling more than just one product. With a beautifully designed blog, focused on readability, GrowthPress is the ultimate WordPress theme for your next content marketing campaign. With many proven lead generation forms, it also allows you to turn more readers into subscribers. 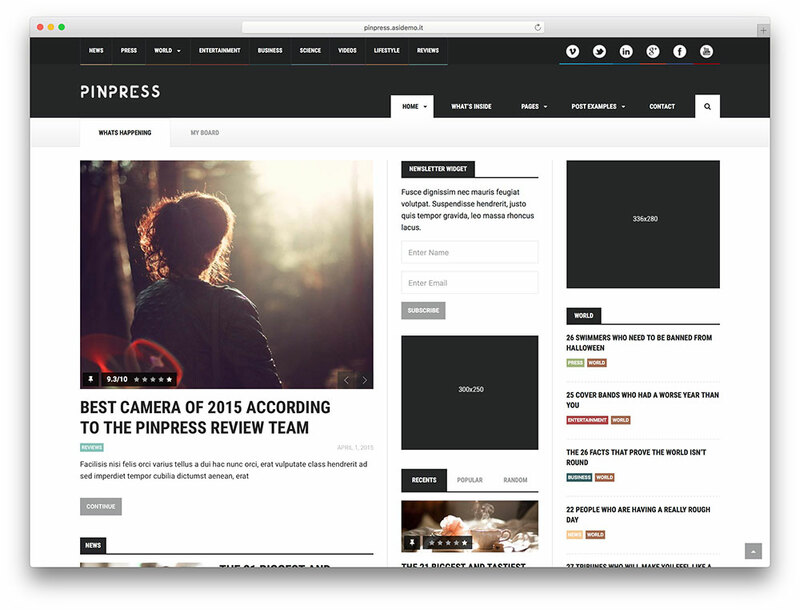 GrowthPress is a fast and mobile-friendly WordPress theme, which means higher rankings in Google search results and lower website bounce rates. With a function to replicate the demo content with a single click, GrowthPress also allows you to set up and start using a website in a matter of minutes. In opposition to Schema, Yosemite is all about the looks. Designed to emulate the looks of Apple’s Yosemite OSX, it offers prebuilt elegant layouts with and without sidebars, and slim, unobtrusive headers. As most of the themes on this list, it’s search engine optimized, with included parallax scrolling, social media share buttons, infinite color palette, and other features. It’s responsive, mobile-friendly, and has retina ready-icons for all the HD screens out there. Of course, its focus on looks doesn’t mean that the performance is lacking. That’s why the Yosemite team claims that their theme has a higher engagement rate than comparable themes, mostly due to their carefully crafted aesthetics. It costs $59 with 6-month support. Does your target audience appreciate a clean and elegant design? Then this is the blogging theme for you, indeed! Another theme that’s all about the looks! It’s super colorful and bold. Sensational combines the ease of use with enough customization options to allow your site to look the way you want it to. It offers 4 layout options, with various styles for elements, and it’s got an integrated slider at the top of your page. Of course, it comes with integrated social media, lightbox for your multimedia gallery, advanced typography, and unlimited backgrounds and color options (even though most of the sites on this list come with these features as well. Responsive design is included, as well as hovering animations and effects, and even retina-ready icons, all with the goal to make your crisp and colorful site stand out from the crowd. It’s optimized for AdSense, and it’s got WooCommerce integration for your affiliate marketing needs. A theme that’s purpose-built for coupon sites and affiliate marketing, Comre’s got it all. For the standard fee of $59, you get an integrated Visual Composer, Slider Revolution, WooCommerce, SEO Ready options, and an overall package of awesome. This jack of all trades, master of none theme performs well in all areas, but doesn’t stand out in anything. Comre is well-rounded and fairly simple to use, so you can make pretty much any kind of website with it. It’s responsive and Comre’s clean and simple, customizable layout is great for no-nonsense affiliate marketers. It has some nice coupon indexation features and a great WooCommerce ecommerce integration, so you can create pretty awesome stores with minimal hassle. All in all, it’s a dependable and solid theme that’s well worth the money. As the name suggests, this is another one of those affiliate WordPress themes specialized in discount and coupon affiliate marketing. Again, this theme is scalable across all screen sizes and operating systems, it’s very fast, but it offers limited design and customization options. It’s compatible with PayPal, Skrill, Stripe, Ideal and PayU, allowing you to utilize all of these payment options and maximize your potential revenue. It also works with MailChimp, letting you make easy and comprehensive email marketing campaigns. CouponXL has an integrated analytics package along with the built-in CTR tracking system, allowing you to evaluate your site’s performance with ease. Another couple of neat features are affiliate cloaking – which makes your partners private – and the geolocation options for stores. The regular license is $49, making it a bit more affordable than some of the other themes. As a benefit, the fairly narrow-minded approach means that it’s really optimized for its purpose, so you can’t really go wrong with this theme if you’re looking to make a simple and effective coupon site. While Voice is mostly aimed at newspaper and blog publishers, it can also be used for e-commerce, thanks to its WooCommerce integration. It offers an ability to make paginated posts with four different pagination types, bbPress and WPreview support for your tags and comments. Similar to other options, it’s responsive, with social media widgets, RTL (right to left) support, unlimited fonts and colors, and advanced theme options. While it’s a bit more limited than some of the other visually-inclined themes, it still has a fairly extensive amount of customization options with 7 different layouts to adapt your site’s looks to your needs. In addition, it has built-in performance options that allow you to optimize your loading times and overall site performance for the most enjoyable user experience. Although it doesn’t offer anything ground-breaking, this is a great theme and it could be just the thing you were looking for. While it isn’t exactly cheap – at $69 – it’s still worth a look. An HTML5 template theme, TopClass is built with bootstrap, HTML5 and CSS. It’s super versatile and can be used to build pretty much any kind of website. It contains all the standard features, and it’s SEO ready, with parallax capability included. That being said, this is one of the themes that need some technical knowledge and desire to tinker to make the best of it. TopClass has Isotope support included, which is really necessary as it has fairly limited visual customization options – it’s got only three or four different page styles with three color variations. However, it’s pretty cheap – $16. If you have the will and the know-how to tinker with it, it can be used to build pretty much any kind of site you can imagine. While built with personal blogs in mind, Throne is flexible enough to be successfully used in affiliate marketing. The personal blogging focus means that this theme puts an emphasis on looks and readability and a lot of customization options to allow everyone to have their personal touch. It has 12 layout options, along with 4 post listing options, allowing for almost 50 different layout combinations. Of course, that’s only the beginning – it also offers several different header styles, along with unlimited sidebar and sticky sidebar options. It comes with all the other typical goodies, such as responsiveness, unlimited fonts and colors, built-in translator, social sharing. Since this is more of a personal blog platform, WooCommerce isn’t directly supported, but it can be added and it’ll work fine. There might be some styling issues, but the support team will iron them out for you, if necessary. This all-around neat package can be yours for the usual 59 buckaroos. Unsurprisingly, this is yet another news and online publication theme, but it’s pretty good in what it does. It’s really well-built, and its 10 different layout options are further strengthened with custom lightbox for your multimedia needs, YouTube/Vimeo playlist options, and a smart sidebar system which adapts depending on the widgets you include. Speaking of widgets, Newsmag comes with some awesome news publication-worthy ones such as the weather, exchange, Instagram, social counter, and popular category widgets. It’s got the standard feature package and it claims that it’s built upon very clean SEO practices, making it compatible with Yoast and other SEO plugins. The WYSIWYG editor is included and makes it super easy to build any type of post you have in mind with no technical knowledge needed. It’s built with AdSense in mind, but it can be repurposed with fairly little effort for e-commerce uses. All in all, NewsMag is just a solid publisher theme that can be adapted for review-type affiliate sites with virtually no trouble at all. This popular product costs $49 in stores near you! A fairly unique theme, PinPress offers some interesting options that other themes don’t. 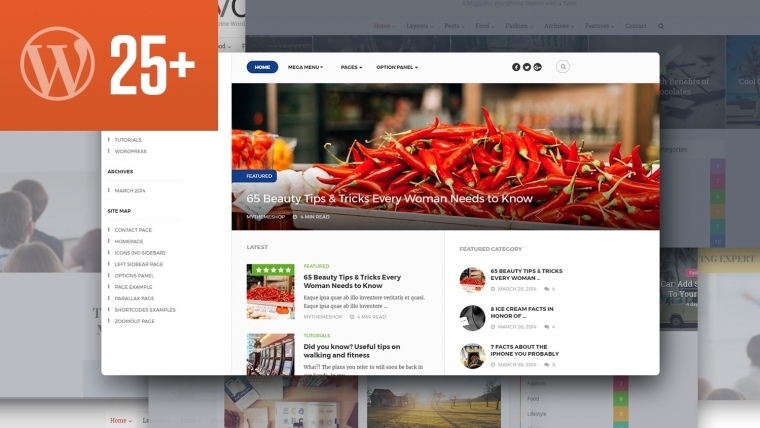 Built mostly for blog creators, it’s the first theme that allows readers to save their reading progress inside their pinboard, which is great for those longform posts that are all the rage nowadays. It has an integrated comment system that includes Facebook, Disqus, and WP default comments, and it includes all kinds of social media integration options. It also comes with the pop-up modals, endless sidebars, search and recommended functions, and an Ajax-powered mega menu for your header with a ton of customizable settings. All in all, PinPress comes with all the standard features with some unique touches, mostly aimed at personalizing the experience of your readers. For $49, it’s a pretty good bargain. Techwise is a simple-to-use theme mostly geared towards tech, gadgets, gear news, and reviews, but it can be used for virtually any kind of content. The default layout has a nice master slider that allows your audience to easily see what you have to offer. While it doesn’t have a lot of different layouts, it’s still highly customizable with persistent sidebars and a mega menu header with lots of different options. Techwise is made with the promotion of successful content in mind, and it has a built-in heat index and trending metrics, as well as an option to pin your best-performing content. It has an integrated multimedia functionality, and a very interesting feature is the side-by-side comparison, an invaluable tool for any sort of review or sales site, especially if it belongs to the tech niche. Besides comparison options, it also has a review system, making it a pretty decent affiliate marketing WordPress theme, all for $49. Another theme that comes with a built-in review system, Goliath is a more generalist platform, with 4 different and distinct styles. While the styles are advertised as sports, news, fashion, and technology related content, I imagine the theme can be used for whatever your heart desires. It comes with the Visual Composer that allows you to drag and drop various elements to customize your pages, and the Slider Revolution to easily implement animated slideshows. Since this is mostly a review platform, it comes with a good Ad support, and you can easily implement Adsense, Iframe, or standard Banner ads. It’s built on a Bootstrap framework, it’s WooCommerce ready, has parallax support, as well as Google rich snippets capability. As a change of pace, this one comes with its own curious pricing, at $62. MoneyFLow is, simply put, built for online money making. It’s SEO-friendly, with optimized loading time, and it’s designed around increasing traffic and growing your audience. Since it’s a money-making theme, it naturally has full AdSense and WooCommerce support. In fact, it doesn’t matter whether you want to make your money via affiliate offers, sales, or AdSense, the doors are open for you. It has 3 pre-built layouts to choose from, with numerous additional options, as well as the standard unlimited colors, and backgrounds, etc. MoneyFlow is also compatible with WP subscribe pro and WP review, so you can build your email list and create reviews in native WP environment. In addition, MoneyFlow is extremely mobile-friendly, and it has a special off-canvas mobile menu that pops in only when it’s needed, allowing for a better mobile browsing experience. This straightforward theme costs $69. Built by a company that created Divi, one of the most popular WordPress themes out there, InReview is purpose-built for review-type sites. It doesn’t really introduce anything groundbreaking, but it comes with that Divi pedigree which kind of makes it one of the premium WordPress themes. It’s simple to use, and it has a special review layout that stands out from other page types that it offers, in order to make it easier to distinguish these pages intended to bring in that sweet affiliate referral revenue. It costs a hefty $89, which might be a bit of a steep price for a fairly basic product. Engine has a fairly unique look but it’s still highly customizable and it all starts with three basic layouts: dubbed classic, billboard, and longform layouts. As one might guess from these layout types, Engine is mostly intended for news and review sites. Even so, it also has full e-commerce integration, with WooCommerce, BuddyPress and a bbPress built in. Furthermore, it’s built as a mobile-first theme, which is important, given that Google intends to make the switch sometime this year. All in all, Engine is a complete and modern package, and it could be yours for the reasonable price of $49. Splash or poor-man’s Schema, is one of the fastest and most responsive themes on the market. All jokes aside, it’s super powerful, quite flexible and one of the dopest affiliate WordPress themes. It comes with 8 unique homepage layouts, with multiple layout options for your posts, and it’s got Visual Composer included for that drag and drop ease of customization. It comes with the standard bag of goodies, such as SEO and multi-language options, WooCommerce, Parallax sliding, and so on. One neat feature that it offers is a rating system that allows your user to grade your site and pages. This increased interactivity gives you valuable feedback and it also increases the engagement of your audience, hopefully increasing retention rates. A theme that was specifically designed for affiliate marketers, Rethink offers a lot of options when it comes to structuring your ads, banners, and reviews. Its main use is as a product review platform with a ratings system included. While it has pretty much all the features that other review sites have, it also has a couple of neat twists. You can create different layouts for different niches, all on the same site. Apart from that, it has a special info bar that you can put at the top for your email list and subscription efforts, and an ability to include up to 16 custom-made banners which you can use to advertise whatever you’d like. It also comes with a bit.ly link cloaking feature and a two-step review system – a short form review that leads to the main review page if the prospect wants to know more. All in all, a nice platform for review type affiliates, currently priced at a typical $69. 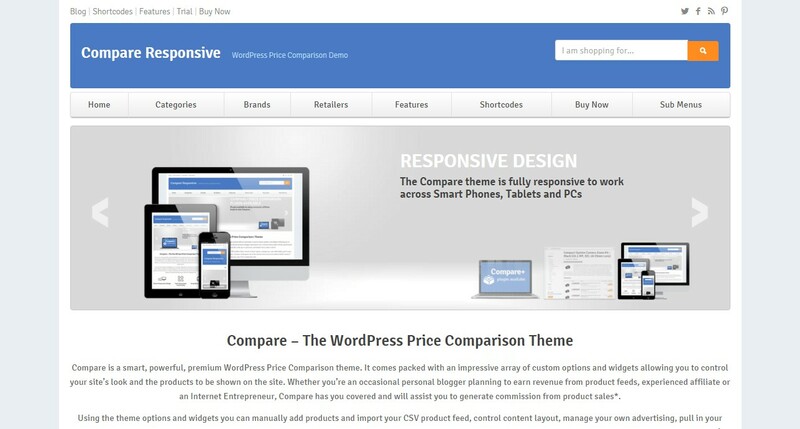 Unlike typical review sites, the Compare theme specializes in, well, comparing items. It’s minimal and subtle in its design so it’s not well-suited for all niches. If your audience are a group of seriously-minded business people, this could be a great theme for you. As you might have guessed, it’s pretty much only good for price-comparison type content but it’s really awesome at it, thanks to the integrated advanced Compare Plus WordPress plugin. It’s got some limited blog capabilities too, so there’s some flexibility regarding your potential content. The target audience of this theme is reflected in its $99 price tag, which really helps you understand it’s one of those premium WordPress themes. Last, but certainly not least, REHub is a great platform for affiliate marketers. It’s a hybrid affiliate theme that’s meant to cover all the possible business models. On the design side, it’s got multiple post formats, a homepage with 13 customizable content blocks, header customization, and an integrated Visual composer. It also has various ad options, such as sticky banner ads, branded pages, and even an Adblock notification system. It costs $59, it’s constantly updated and there’s a ton of additional packets and plugins that can be purchased, if they’re not already included in the price. Overall, a very powerful theme that can do it all, literally. There you go, a list of some of the best affiliate WordPress themes the internet has to offer. If you found the one you like and you end up making a killing off of it, don’t forget to thank Mobidea’s Experts! While choosing your theme is far from the last step in your marketing journey, it’s a very solid beginning. From here on out, with some perseverance, creativity and a lot of work, you can create a generous revenue stream for yourself, and live like a king!